It’s Thanksgiving Day and of course you have to have seconds of everything, maybe even thirds. As a college student you have to cherish every home cooked meal you can get. Only now you kind of resemble the stuffed turkey your family just devoured. 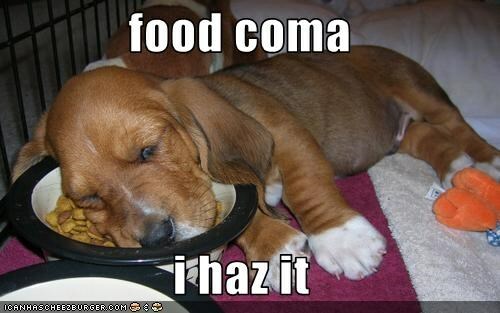 Here comes the dreaded “food coma”. Aptly named, a food coma is when you stuff yourself so much that you just HAVE to take a nap. Most people know what a food coma is, but what causes a food coma? One of the first things people think of is the sleep inducing hormone called melatonin. Your body makes melatonin and distributes it at various hours of the day. For example, in the evening, more melatonin is produced. Also depending on the amount of light your body gets, it may change the times melatonin is made. The food we consume also has melatonin but our body is the main source of melatonin. So if it isn’t the melatonin in our food, what is the true culprit? One thing that could cause the food coma could be having too much insulin. The insulin converts into melatonin, which increases drowsiness. According to the article above, foods that have a lot of fibre balance insulin and blood pressure. So if you want to stay awake after a big meal, try whole grains! Another possible reason could be that the food you ate was high in tryptophan. Tryptophan is found in high protein foods. The amino acid helps the body make serotonin, which is a sleep inducing hormone, among other things. So blame the turkey this holiday season! This entry was posted in Uncategorized on September 13, 2016 by Alexis Paige. I love the topic of this article, especially since I already have a countdown started until Thanksgiving!! One of my favorite holidays AND a good, home cooked meal that none of this dining hall food can compare to. To say the least, I am looking forward to this great turkey dinner, but I do hate the food coma that it induces!! Every year my family has all of these plans for after we eat dinner, but once we are done, we have no motivation to go do anything and decide that we need a nap instead. Everyone always blames it on the turkey, and now I know exactly why! I can’t wait to go home this holiday and share this interesting fact with all of them!! After reading your article, I decided to do a little research on my own and found this list of ways to fight the Thanksgiving food coma , and I think my family might have to try a few of them this year! I’m not sure if any of these tips have ever been scientifically proven or experimented, but they all seem like good ideas to me. Check it out! This article was a very fun and interesting read. Many of us, myself included, accept that with a large hearty meal, a food coma is expected. We however never seem to question why or what causes it, i personally always assumed it was because our body was being drained of all of it’s energy in an atempt to process all our food. Studying out of state for me means that every time i get to go home for the holidays i make a list of all the home cooked meals i want my mom to make and devouring them without remorce. Being in college also means that when i am at school i am snacking often and even late into the evening. Eating late at night would seemingly make you tired since your body produces more melatonin, yet an issue that is prominent in college students is the inability to sleep. Many friends of mine even go as far as eating their biggest meal at dinner time then still having to take melatonin pills to help them fall asleep a few hours later. Doing all this still does not work for some of them. This could possibly be linked to their ussage of computers in bed. This article below by Figueiro, Wood, Plitnick, and Rea states that the blue tint coming from screens like laptops and televisions could be suppressing the melatonin and therefore making it harder for them to naturally get tired on their own. I also agree with your post. After my family finishes eating our Thanksgiving dinner, or any major holiday dinner, a majority of us end up falling asleep on the couch feeling extremely full. I was always curious as to why I was feeling so tired and the article you shared gave a lot of helpful information. I also found this interesting article (http://theconversation.com/health-check-food-comas-or-why-eating-sometimes-makes-you-sleepy-44355) that reiterates the facts and points you shared and also gives some helpful tips on how to not fall into a food coma. I am a multiple time offender of the food coma. Usually whenever I sit down for dinner I tend to eat to the point of no return as I call it. It is when you eat so much you just do not stop until you physically cant move. I agree 100% with your post, it is true because when I am finally done eating I get almost like a feeling of drowsiness. The article says that if you want to stay awake to eat more whole grains, there is another issue for me I eat absolutely no whole grains. If you love food and love to eat the food coma is just something you are going to have to get used to because for me there is no question about it I love food an have trouble putting down the fork.